Yoga Can Help You—But Which Kind Is Best? Yoga—It Can Change Your Life! An 80-year-old instructor shares her stay-young poses. Not that long ago, yoga was viewed primarily as an activity for “youngish” health nuts who wanted to round out their exercise regimens. Now: Older adults—meaning people in their 60s, 70s, 80s and beyond—are among the most enthusiastic practitioners of this ancient healing system of exercise and controlled breathing. 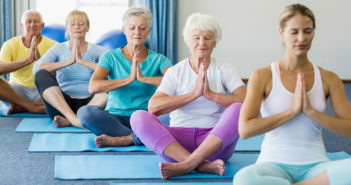 To learn more about the unique benefits you can derive from yoga, Bottom Line/Health spoke with Mary Louise Stefanic, an 80-year-old yoga instructor who has taught the practice for more than 40 years. Virtually everyone can benefit from yoga. Unfortunately, many people are reluctant to try it because they assume that it’s too unconventional and requires extreme flexibility. Neither belief is true. What’s more, its varied health benefits are largely what’s making the practice so popular now with older adults. More than 1,000 scientific studies have shown that yoga can improve conditions ranging from arthritis, asthma, insomnia and depression to heart disease, diabetes and cancer. You look better, too: Yoga is quite useful in helping to prevent rounding (or hunching) of the back, which occurs so often in older adults. This condition can lead to back pain and breathing problems as the rib cage presses against the lungs. My experience: After teaching yoga to thousands of students, I’m continually amazed at how many tell me that it has literally changed their lives by helping them feel so much better physically and mentally. Knees to chest pose. For low back pain and painful, tight hips. What to do: Lie on your back (on carpet or a yoga mat, available at sports-equipment stores for about $25). With your arms, hug both knees in to your chest. Keep your knees together and your elbows pointing out to each side of your body. Slowly rock from elbow to elbow to massage your back and shoulders. Take deep, abdominal breaths while holding your thighs close to your chest and hold for six complete inhales and exhales. Mecca pose. This pose also relieves back pain. What to do: Begin by kneeling on the floor with your knees together. For added comfort, place a small towel behind your knees. Sit back on your feet, and lean forward from your waist so that your chest and stomach rest atop your thighs. 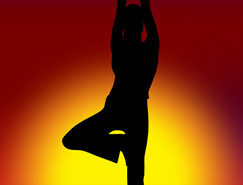 Reach your arms out in front of you, resting your forehead to the floor while stretching your tailbone to your heels. Hold for six complete inhales and exhales. Leg rotation. For sciatica, a cause of back, pelvic and leg pain. What to do: Lie on your back with both legs extended. Slowly bring your right knee to your chest and inhale. Rest your right ankle on the front of your left thigh, and exhale as you slowly slide it down along your left knee, shin and ankle to toes. This helps “screw” the top of your right thighbone into the hip socket, easing lower back and leg pain. Repeat on other side. Do three times on each side. To conclude your session: While in a sitting position, press your palms together. Bring your thumbs into your breastbone. Tuck your elbows in and down, press your breastbone to your thumbs, lifting and opening your chest. Hold for six breaths. Important: Even when you’re not doing yoga, don’t forget your breath. Slow, thoughtful, deep breathing is most effective, but don’t perform it too quickly. I find the technique to be most effective when you hold the inhalation and exhalation for a certain number of counts. What to do: Lie on your back, resting your hands on your belly so that your middle fingers touch across your navel. Inhale through your nose for a count of six, pushing your navel out so that your fingertips separate. Pause, then exhale for a count of nine, pulling your navel back in. Perform these steps two more times (more may make you dizzy). Do this in the morning and at night (deep breathing improves mental focus and can be energizing in the morning and calming at night). *To find a yoga class near you, check your local community center and/or consult the International Association of Yoga Therapists.